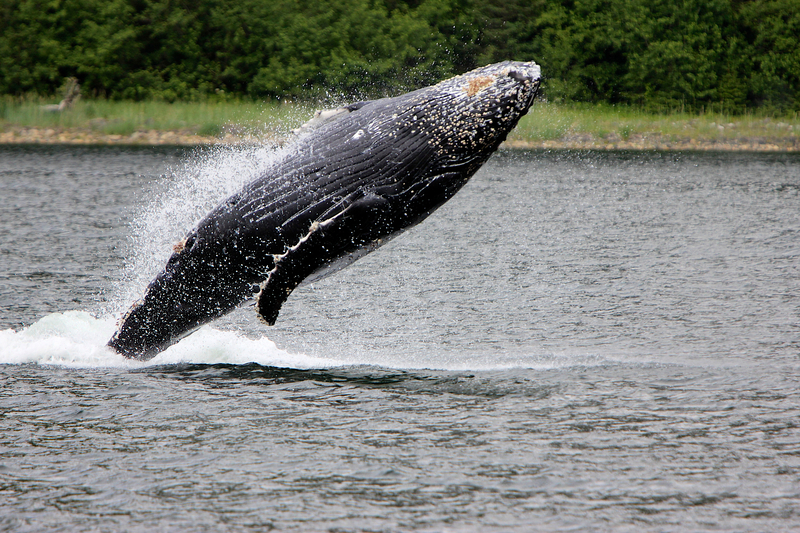 A cruise through Canadian and Alaskan waters isn't complete without a bevy of bear, whale and bird sightings. He is a very big bear! He is white with cinnamon and apricot highlights. He has a huge head, fluffy legs and giant claws — and he is coming straight toward me. I’ve been waiting for almost six hours on the stream bank hoping to see a mystical spirit bear and now, here he is, on his search for the day’s salmon meal, walking slowly across the boulders and rocks that line the water. I slip slowly down the damp bank and click pictures as fast as I can. My heart is pounding as he walks right in front of me. I watch in awe as he catches one salmon and then another. He moves deliberately up the riverbed, splashing and fishing as he passes by. 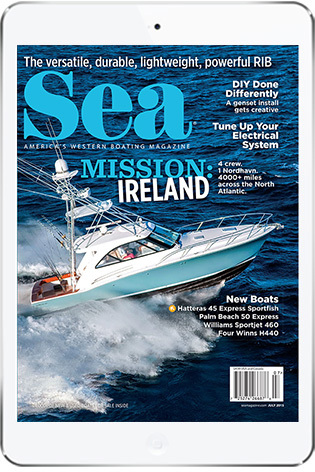 That encounter was the highlight of my 11 summers of boating and wildlife viewing in Canada and Alaska aboard our 55-foot Fleming, Mola Mola. Wildlife viewing is one of the highlights of any cruise along the coast from Puget Sound to Alaska. 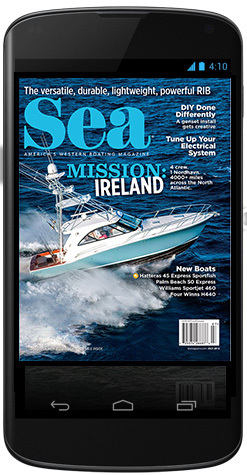 We’ve learned a few things that could help other boaters experience better natural encounters. I’ve seen estimates that there are fewer than 400 spirit bears in the coast area that stretches from southeast Alaska southward to the tip of Vancouver Island, in an area known as the Great Bear Rainforest. The spirit bear is actually a color morph of the North American black bear, a rare subspecies and a sacred part of the local indigenous people’s history. We started our search for the elusive bear on our way to Alaska in May, going so far as to stop at the isolated First Nations village of Hartley Bay and track down the local spirit bear guru, Marven Robinson, who has been guiding visits to see spirit bears for more than 20 years. He has set up viewing platforms on Gribbell Island in the Gitga’at Territory, and he offers half- or full-day adventures. We arranged to meet Robinson again on our way home from Alaska in September, the best time of year to find a white bear. 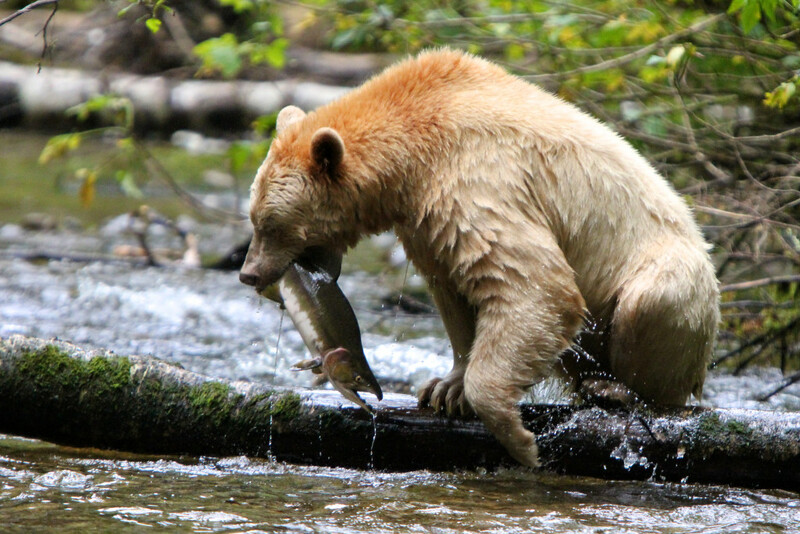 The spirit bear is the most rare and unusual of the bears you will see along the Inside Passage. But seeing any bear in the wild is an exciting treat. Bears of all sizes and shades of black and brown are plentiful in most bays and anchorages from the Broughton Islands north. If you get in the habit of scanning beaches at low tide, you will often be lucky enough to see a bear. Early in the season, May and June, you will find bears turning over rocks on the beach and foraging for sedge, a green roughage that gets their system going after the long winter’s nap. Some of our best bear viewing has happened during May and June. Later in the summer, the bears move along streams as salmon become plentiful. One of our favorite stops for spotting bears on the trip north is Khutze Inlet, which extends five miles from Graham Reach. At high tide you can take a dinghy up the small waterways on either side of the drying flats in the middle of the bay. We have seen a good selection of water birds on these explorations, and we’ve been lucky enough to encounter brown bears working the beaches. 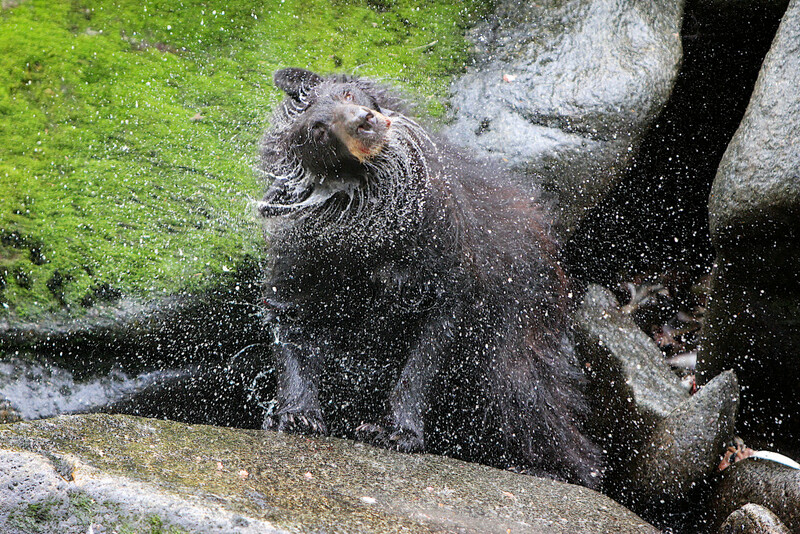 Pack Creek on Admiralty Island has an outstanding bear-viewing area that has been managed by the Forest Service and the Alaska Department of Fish and Game since 1935. The island boasts a healthy population of 1,500 bears but has no human facilities on site: no bathrooms, no shelter from the elements, no cellphone service, no dock. Rubber boots are a necessity. Permits are required from June 1 through Sept. 10, and peak season begins July 5. Pack Creek is a wonderful place to view Alaskan brown bears as they fish for salmon and interact with each other. We have even had great bear viewing from the boat when we weren’t able to go ashore. Anan Wildlife Observatory is 30 miles southeast of Wrangell, Alaska, and is one of the only places you are likely to see both black and brown bears in one location while they fish for pink salmon in Anan Creek. After a scenic walk from the trailhead at the beach, you arrive at a viewing platform that overlooks the creek. (There are outhouses at the trailhead and also near the deck.) Once you reach the viewing platform, you can sign up for 30 minutes in a wonderful photo blind that puts you close to the action as the bears vie for their special fishing holes. Permits are required from July 5 through Aug. 25, and since the blind offers world-class bear viewing, obtaining a permit can be very difficult. In addition, some of the cruising guidebooks discourage anchoring near Anan. We usually hire a guide in Wrangell and travel by jetboat to the Anan Observatory. We book our trips early in the summer to guarantee a spot later in the year on our trip south. Sometimes it’s fun to focus one’s attention on the smaller wildlife along the route. Our first stop while traveling north is always Mitlenach Island, a Nature Provincial Park that is a short boat ride from Campbell River in the Strait of Georgia in British Columbia and home to the largest seabird colony in the area. It is an important nesting locale for thousands of glaucous-winged gulls, as well as pelagic cormorants, pigeon guillemots, black oystercatchers and others. If weather permits, take a dinghy ashore and meet the volunteers that staff a small outstation in Camp Bay. A designated trail through fields of wildflowers leads to an observation blind from which you can observe the “family life” of the nesting gulls. Take your boat by the cliffs on the southwest side of the island and observe the pelagic cormorants and pigeon guillemots that nest precariously on the rocky ledges. Mitlenach is treasured by many, and we think it’s a very special place that’s worth a stop. We have two favorite birding locations in Alaska. 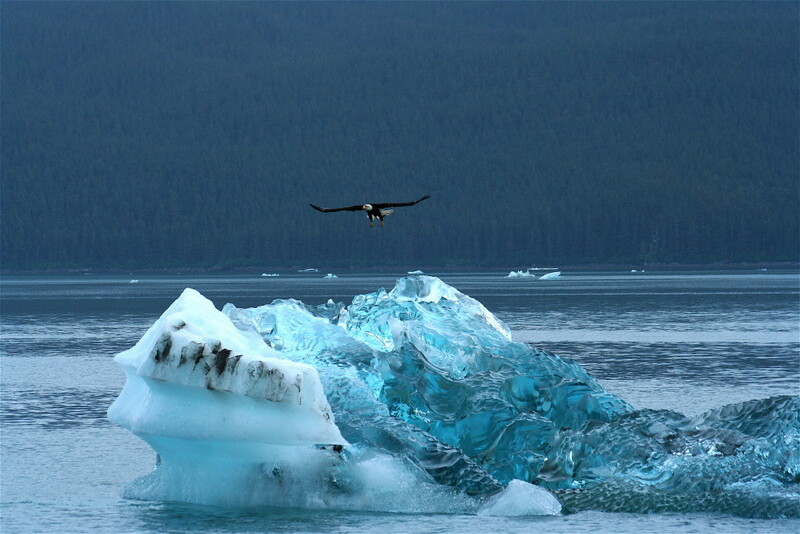 The first is the glorious wonder that is Glacier Bay National Park, the magical home to all sorts of wildlife. A non-fee permit is required between June 1 and Aug. 31, and we always try to book an entire week in the park. A careful observer is almost sure to spot dozens of whales, mountain goats, bears, wolves, otters, marmots and hundreds of unique birds that include Arctic terns, black-legged kittiwakes, Brandt geese, common loons, surf and white-winged scoters, murres and murrelets, pigeon guillemots and so many more. The highlight for most birders, however, are the tufted puffins. Who can resist the comical puffin with his giant red and yellow bill and distinctive yellow tufts? Puffins can be seen floating near South Marble Island and nesting on the cliffs of Blooming Nob north of Tidal Inlet. It takes a sharp eye to spot the puffins tucked securely into crevices between rocks. They need to be high enough that they can take off successfully, and they like the inaccessible cliffs that protect them from terrestrial predators. Our second-favorite birding spot is St. Lazaria Island, which rises only 180 feet above the sometimes wild entrance to Sitka Sound. The rugged island was established as a seabird refuge in 1909 and is a unique temperate rainforest island that provides a safe nesting haven for almost 500,000 birds. The first time we braved the 15-mile crossing from Sitka to St. Lazaria, we were greeted by rain and strong winds, conditions that can be present throughout the year and can make bird watching uncomfortable and not very rewarding. However, the second time we waited for a calm, sunny day, and the trip around the island was nothing less than spectacular. The island itself is a 60-acre clump of dramatic volcanic rock with unique peaks and caves around every corner and birds of all sizes and shapes whizzing overhead and splashing in the waters. Watch closely for the burrows of petrels, tufted puffins and rhinoceros auklets. Pigeon guillemots, common murres, glaucous-winged gulls and pelagic cormorants cling to the rocky crevices. Boaters cannot go ashore at St. Lazaria, because of the risk of crushing nests and eggs, but a trip around the island is a magical journey that is well worth the effort. When whales are in the area, all other activities on our boat come to a sudden halt. One never grows tired of observing the powerful and inquisitive giants. You will undoubtedly see a good assortment of orcas, humpbacks, minkes and fin whales on your travels through Canada and Alaska. On our trips north and south, we allow extra days to hang out and whale-watch near the Broughtons. We often see orcas in Blackney Passage as they work their way down to Robson Bight, which is a small Vancouver Island bay that was established in 1982 as a sanctuary for killer whales. Keep a watchful eye for orcas, maintain a 100-meter distance from the whales and approach from the side rather than from the front or back of the pod. Keep a very low speed or put your engine into neutral or idle. In recent years, the area just north of Blackney Passage, Blackfish Sound, has become a very popular fishing area for humpbacks. We’ve been lucky enough to see spectacular breaching, lunge feeding and tail slapping activities in these waters. 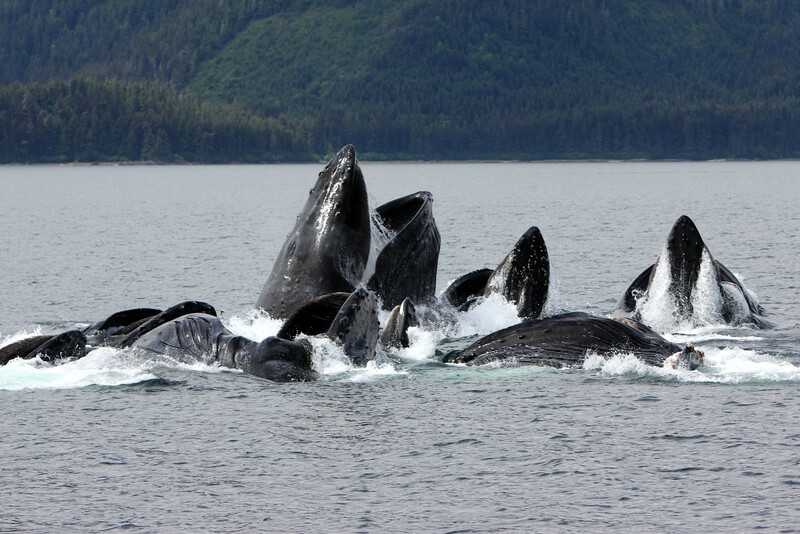 In Alaska, humpback whales often convene in Frederick Sound just above the Five Finger Islands Light. On one occasion, while we idled and silently watched the whales, a giant humpback steamed toward us at full speed and seemed intent on ramming the boat. He slowed suddenly and turned to look curiously up at us. His barnacle-spotted head and giant eye were focused on his observers. He slowly circled the boat at very close range. When he reached the stern, he gave us one more long look and dove down, giving a wave of his tail as a farewell. No need zooming in the lens on my camera. The tail filled the entire frame. We were in awe. On another day, we were treated to an hour-long display of breaching and tail slapping as the sunlight turned the humpbacks’ blows into rainbows. The holy grail of a summer of whale watching is bubble net feeding. Humpback whales feed by bubble netting, where a group of whales will swim in circles and blow bubbles underwater. The bubbles surround and confuse the small fish and krill that they eat. When one whale gives an audible signal underwater, all of the whales come up in the center of the bubbles with their mouth wide open. Boaters are lucky, indeed, if they happen upon such an amazing and rarely viewed display of cooperative foraging. We’ve had our best luck finding bubble netting in the waters around Chatham Strait, near the entrance to Peril Strait. Keep an alert watch and listen carefully to your radio. 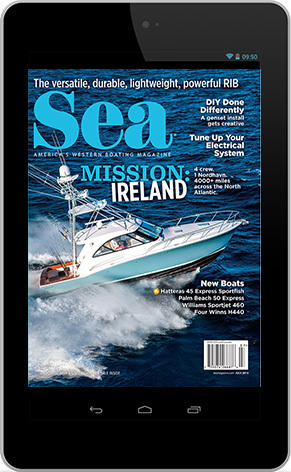 Watch your AIS and radar for boats that might be sitting in one area for a long time. It takes luck and patience! Wildlife is abundant throughout Canada and Alaska. In the course of a summer season, you will have extraordinary and unexpected experiences with all sorts of sea and land creatures. However, if you set yourself up with expectations of seeing whales breach and bears wrestle on a daily basis, you will likely be disappointed. Go with an open mind and open eyes. Travel with a fluid plan and be willing to stray off course in search of wildlife. Only the curious and inquisitive will uncover all of the magic that nature in this magnificent part of the world has to offer.